Cowon Plenue P1 review | What Hi-Fi? 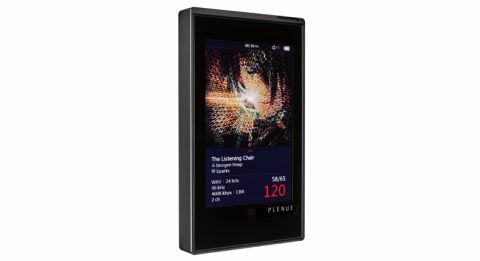 Cowon’s flagship player, the Plenue P1 is a refreshingly focused unit. It’s a music player and nothing else. If you’re after internet, video or something you can download a few apps onto, this is not the machine for you. The Plenue P1 is one for the hi-fi purist – someone who puts sound performance above all else, and is willing to spend well over £700 for it. Take the Cowon out of its packaging and things start well. This is a solidly built player, made of nicely finished anodised aluminium and about the size of a pack of cards. Its edges are slightly rounded but the overall feel is of a chunky angular unit – an impression reinforced by a weight of around 170g. The physical control count is low, with just hard buttons for power, play/pause, skip and volume. The power button is a touch vague in use, but the others are precise enough to satisfy, though the small 0.5dB volume steps make bigger level changes slow and mildly frustrating. The rest of the functions are accessed from the 3.7in AMOLED touch screen. It’s responsive in use, though we wish some of the on-screen icons were a little bigger to help those with chunkier fingers. The look of the display is customisable, with Cowon offering a range of skins as well as a number of distinct options for the look of the barely useful but somehow highly appealing power meters. On the whole the P1 is easy enough to use and offers a number of tweaky adjustments – such as the type of digital filter used or adding gain to DSD recordings to reduce volume discrepancies between these recordings and those on PCM. Less useful, for us at least, are the multitude of EQ settings. There’s a staggering 50 EQ presets on offer – from the usual Normal and Bass Boost options to leftfield settings such as Feel The Wind, Mild Shore and Flange. We settle on using the Normal setting and something called BBE, which claims to improve transient and phase of the original recordings. Sonically, it adds a touch of bite compared to the less processed-sounding Normal option, and that works well with some material. If all that adjustability isn’t enough, there are four users presets that allow almost unlimited opportunities to manipulate the signal for those with the time and inclination. File compatibility is impressive and includes PCM files up to 24-bit/192kHz, single and double speed DSD as well as DXD. Chances are, whatever file you have, the P1 should play it. All the number crunching is done by Burr-Brown’s well-regarded PCM1792A chip, which bodes well, as it’s also found in a number of higher end stand-alone DAC designs. The Cowon has 128GB of built-in memory as standard. This is expandable to a maximum of 256GB thanks to a microSD card slot (hidden behind a plastic flap on the base). A microUSB under the flap opens up the P1 to being used as an outboard DAC for a computer, which is useful. The player’s headphone socket also doubles as an optical output, which is less so. Built into the Cowon’s case is a 3000mAh battery that is good for a claimed 8.5 hours of continuous use. That’s broadly what we achieved, but of course, such figures can’t be particularly accurate as much depends on how much volume you use and how demanding your headphones are. We used Sennheiser Momentums and B&W P3s along with a pair of Grado PS500s for most of this test. You’ll need headphones too, as the Plenue doesn’t have built-in speakers. It doesn’t have Bluetooth either, so you can’t stream music wirelessly to a speaker or system. Those that use Smartphones for their regular music fix are in for a treat when they listen to the P1. Compared to even the best of that breed the Cowon is in a different league when it comes to sound quality, as well it should be considering the price. We start off with the 2015 remaster of Alanis Morissette’s Wake Up and are impressed with what we hear. This 24-bit/44.1kHz recording is delivered with an authority and solidity very few portable players come close to. Alanis’s vocals come through with delicacy and power, while the driving bassline is pleasingly weighty yet agile. Yes, there is a touch of excess richness, and perhaps it could do with a degree of extra grip, but neither of these go far enough to be an issue for us. Instead we wallow in the authority of the presentation and the pleasing warmth the rich bass helps to impart. Moving onto Bjork’s Lionsong (24-bit/96kHz), the P1’s articulate and refined nature is neatly demonstrated. The player’s laid-back sonic balance works well here, as does its ability to dig up instrumental textures and render them in a subtle way. This is a relatively sparse recording yet it still needs a firm organising hand as the string-led instrumental backdrop can easily veer towards hardness and confusion. The P1 does this superbly. This player’s civilising approach becomes more obvious on tracks that demand some attitude. alt-J’s The Gospel of John Hurt (16-bit/44.1kHz) sounds relaxed when it should excite. The P1 doesn’t capture the bite in the track nor the relentless momentum as well as we’d like. Yet, that’s not to say its rendition isn’t enjoyable. We found ourselves paying more attention to the vocals than usual, enjoying the insight on offer – there’s a plentiful supply of detail here. That authority we so liked before is clearly evident here, as it’s the player’s ability to stay composed when things get complex. We used the Plenue as a stand-alone DAC and got some fine results with an Apple MacBook loaded with Pure Music software as source. We listened to a range of files from Eminem’s Mockingbird (320kbps) to Hans Zimmer The Dark Knight Rises (24-bit/192kHz) and thoroughly enjoyed what we heard. The sound of the Cowon when used this way is a significant improvement over that of the laptop alone, delivering a combination of resolution, insight and dynamic expression the computer barely hinted at. While the Plenue P1 isn’t beyond criticism, particularly at its elevated price, there’s much to admire here. We love its refinement and articulate nature, and even though the richness tends towards excess, particularly at low frequencies, the side effects of this are rarely less than enjoyable. Yes, the multitude of EQ options give plenty of scope to fine tune the presentation, but no combination we tried fundamentally altered the player’s mild-mannered nature in a convincing way. Despite this, we like this Cowon. It’s worth a serious listen.